SoftPlanet makes it possible for everyone to get free Pale Moon download directly from our servers. There is no registration needed for downloading. There's a new kid on the block and in case you haven't heard of it, it is called Pale Moon. 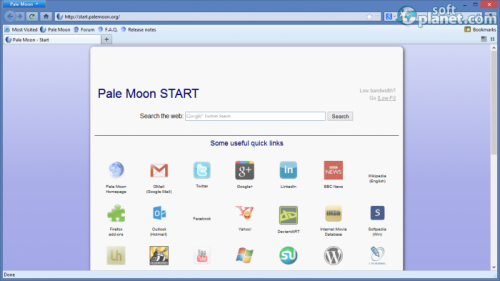 The name will likely raise a few eyebrows so here's the answer to the impending question – Pale Moon 25.3.1 is a web browser. Not the most popular for sure but it's here. Based on Firefox technology Pale Moon promises to offer improved and optimized programming code, more and better features and speed for people who use web browsers all the time. 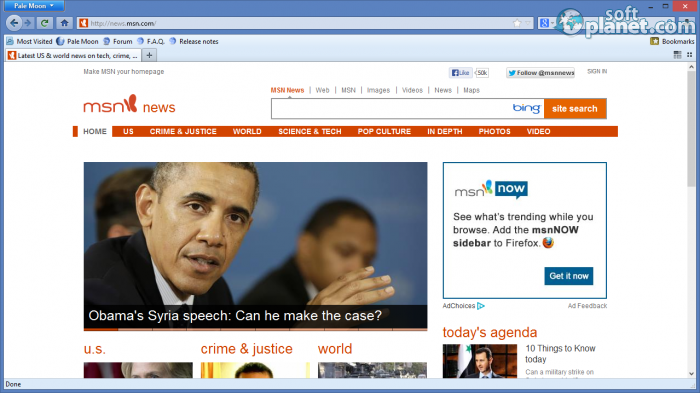 In a few words Pale Moon is an optimized version of the popular Firefox browser. Pale Moon is basically Firefox in a new skin. There isn't much else to it except for a few new functions here and there that make the browser more user-friendly. But on the outside it is simply Firefox, which is not a bad thing after all – Pale Moon offers easy and fast installation that goes just like the installation of Firefox, a user's interface that is the same as the one found in Firefox and the same easiness of use that we've gotten to see out of Firefox. The interface of Pale Moon looks strikingly like the interface of Firefox and this is not surprising as both programs share the same source code. This means that if you are used to using Firefox you will be able to start using Pale Moon immediately. You get the same Firefox button in the upper left corner, the same browser buttons, the same address bar, the same search engine in the upper right corner... pretty much everything is the same. There are some changes though and they include a few new bookmarks in the upper left corner including for a Pale Moon forum and some more options in the Options menu, as well as some technical changes when compared to the regular Firefox browser. Do we need to explain how to use a web browser? Pale Moon works just like Firefox – fire up the program, enter a web page address and wait for the page to load. It's as if you are using a Firefox build. Despite the promises for better speed and stability we did not see any differences in functioning when compared to Firefox. Still the overall blue shade is a nice touch that makes Pale Moon look great. 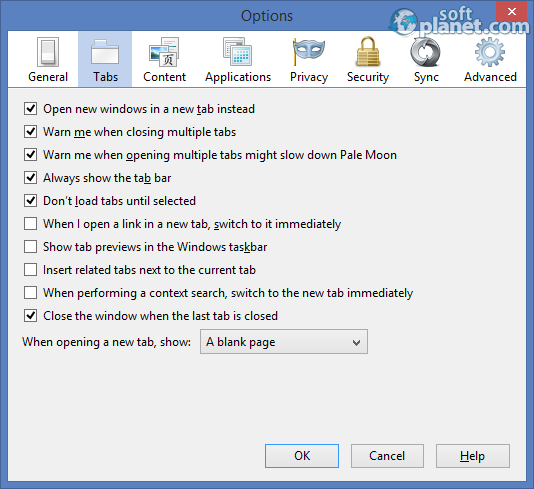 Pale Moon 25.3.1 can become a nice break from most popular browsers such as Internet Explorer, Opera, Google Chrome and Mozilla's Firefox. Built on the same engine as Firefox, Pale Moon offers more functionality, a nice blue color for the interface, improved functions when compared to Firefox and some optimizations. 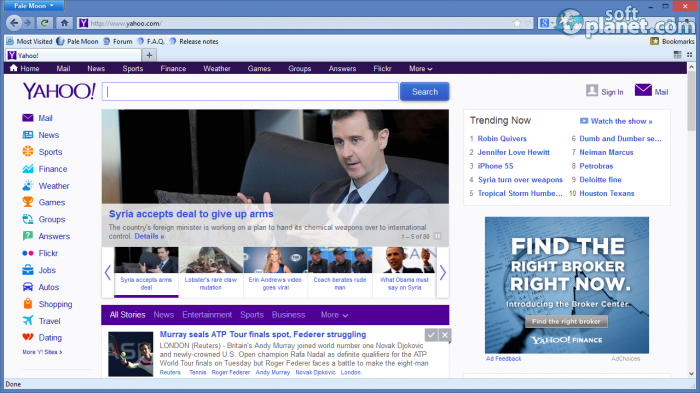 It is not that much different from Firefox, at least on the outside, and feels just like it. This does not make Pale Moon bad – it's just something new and innovative based on Firefox like many other browsers such as Chromium, on which Google Chrome is based. Our security scan shows that Pale Moon is clean from viruses. The current version of Pale Moon has been scanned by our system, which contains 46 different anti-virus algorithms. That ensures that Pale Moon 25.3.1 is 100% safe for your computer.